Hydraulic cranes has always played a very important role in material handling in manufacturing industries and will continue and also hydraulic crane are well known for providing a much greater lifting capability. 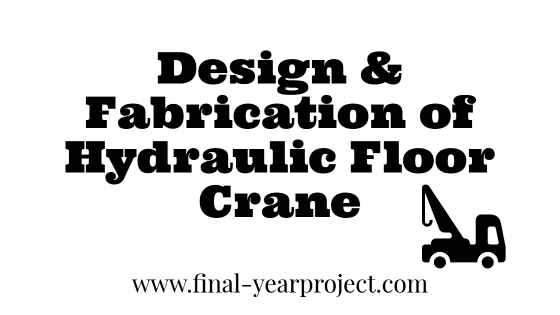 This project aim to fabricate a hydraulic operated floor crane for handling various kinds of materials. The hydraulic floor crane consists of truck, hydraulic cylinder, hydraulic tank, hydraulic hoses, DCV, beam and hooks. This crane reduces the worker’s fatigue and increases the overall efficiency of production processes with good safety. 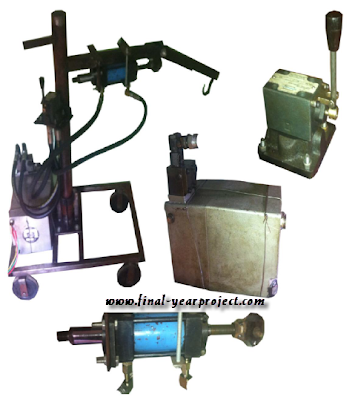 Subscribe to our newsletter for more such Mechanical projects. In this project, the beam one end is fixed to the truck and another end is attached to the hooks. The hydraulic cylinder is connected to the horizontal arm. The hydraulic tank is pumping to the hose in upward direction. At the same time material is lifted with the help of hook and hydraulic cylinder released to the pressure valve so the material is unloaded. The material from one place goes to the other place with the help of hydraulic floor crane. The crane is fabricated with complete clear front, small compact frame, good reach, high lift and with low center of gravity. The crane has the capacity of lifting 10 kg with widespread application in the shop floor. Thus the floor crane would serve as a safe and versatile model for material handling operations. This report includes study & parts of hydraulic crane, design calculations, the manufacturing process of hydraulic crane, assembly diagram etc. and this project weighed 20kg which is capable of lifting load up to 10kg using hydraulic power. Use this project for your reference and study work only.